Fox Feature Syndicate published Wonder Comics #1 in March 1939. Wonder Man was Fred Carson, a timid radio engineer and inventor. While in Tibet, a yogi gave him a ring which granted him super strength and invulnerability. He was created by Will Eisner. You can already see Eisner’s innovative layouts with Wonder Man’s arm extending over the panel frame and into the next one. Some accounts say that Victor Fox was a bookkeeper for DC Comics who saw the sales figures for Action Comics and decided to start publishing his own comic books. Others say he was an astrology magazine publisher who just learned of the sales figures. Either way, he hired Eisner & Iger to come up with a new superhero character. DC sued Fox Feature Syndicate for copying Superman, one of the first of many lawsuits defending their characters. 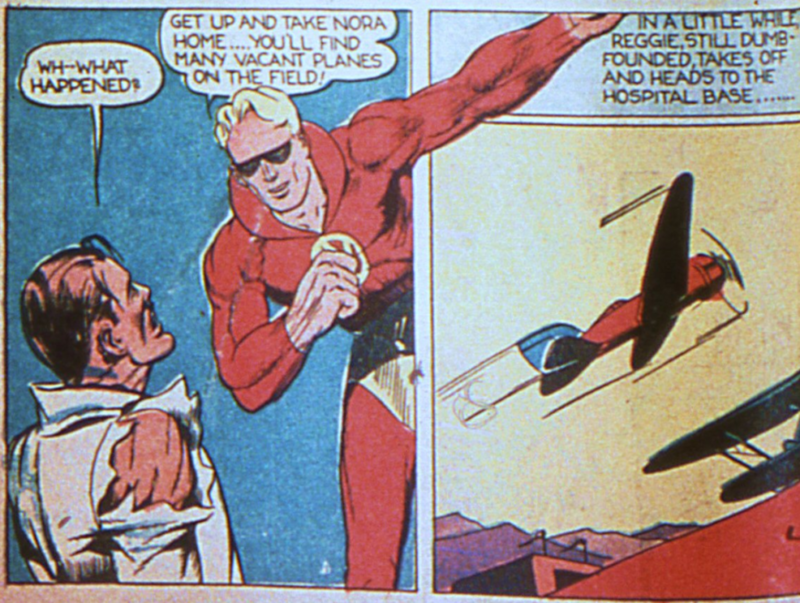 Despite Eisner testifying that Wonder Man was his own creation, Fox Feature Syndicate lost the case and this was the last appearance of Wonder Man. It was fascinating to learn that basically Eisner lied on the stand and later in his life admitted that Victor Fox asked him to copy Superman.